APPLICATION FOR GRANT CYCLE 2022 - 2024 WILL OPEN IN 2021. Please click on announcements for more detail. Creative Commons License The Constitutionalism Fund’s policy is to ensure that both its own work product and that of its grantees furthers its mission and charitable purposes and that it benefit the public. To that end, the Constitutionalism Fund has granted a Creative Commons Attribution-NonCommercial-NoDerivs 3.0 license to virtually all of its own work product. Under the terms of this license, anyone may copy and widely distribute the Constitutionalism Fund’s work product available on this site, without charge, for non-commercial purposes only, provided that they do not alter it, that they credit the Constitutionalism Fund or the identified author as the creator, as appropriate, and that they provide a link to this website. The Joint Fund to Promote and Advance Constitutionalism in South Africa (Constitutionalism Fund – CF) is a collaboration between The Atlantic Philanthropies, the Ford Foundation and The Open Society Foundations, with a combined investment of US$25 million to be spent on grantmaking over a ten to twelve year period. Advancing sustainability of the field and its institutions. The constitution of South Africa is the supreme law of the country of South Africa. It provides the legal foundation for the existence of the Republic, sets out the rights and duties of its citizens, and defines the structure of government. 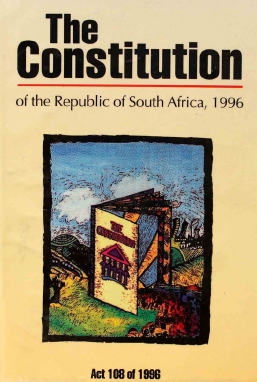 The current constitution was drawn up by Parliament elected in 1994 in the first non-racial elections and promulgated by President Nelson Mandela on 18 December 1996. The constitution came into effect on 4 February 1997. The Constitutionalism Fund aims to breath life into the constitution, such that the people of South Africa use it as a living document supporting the substantive promotion and realisation of rights, with particular attention to those who are poor, stigmatised or marginalised. Transformation of organisations and social movements in this field refers to the importance of them reflecting the values of the constitution and the demographics of the country. Sustainability of organisations and social movements refers to institutional capacity to pursue their goals over the long term and resilience to withstand inevitable changes in staff, leadership and funders. A Selection Panel of eminent South Africans has shaped the specific objectives of the Constitutionalism Fund, chooses its grantees and assesses the progress of the Fund towards achieving its long-term goals. Two Coordinators are responsible for engaging grantees and the field and provide the Selection Panel with the requisite information and due diligence it needs to make grants, assess the Fund’s progress and future direction. They are supported by an Administrator.